Circa 1804. This Federal-style home was given as a wedding gift from a father to his daughter and new son-in-law. It was constructed the same year Thomas Jefferson was re-elected to the presidency. Each guest room is different. Several offer two-person whirlpools, eight have a fireplace. Canopy, four-poster and sleigh beds are among the furnishings. In the afternoons, tea is served in the garden room. The breakfasts feature gourmet fare and are served by candlelight. The inn is located in a local historic district, just minutes from shops and restaurants.Publicity and Awards: Yankee Magazine 2008 Editors Choice.Location: Ocean Community. Katahdin is a charming room located on the third floor of the main house. It has a queen size bed, private bath with shower, flat screen TV, and a beautiful view of the historic residential district of Kennebunkport. River Green is a lovely, bright room privately located in its own corner of the third floor. It has a private bath with a tub and shower and a flat screen TV. A queen size mission style bed is placed under a skylight for viewing the starry nights. 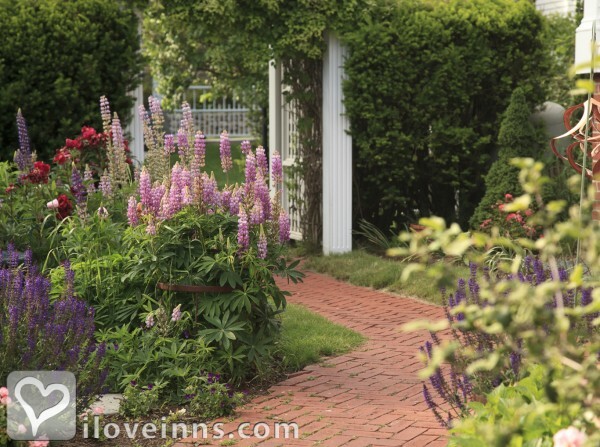 Two trapezoidal doors give guests a wonderful overlook of the inn's private lawns and gardens. Chatham is a beautiful room located on the first floor in the oldest part of the main house. It's perfect for those who wish to avoid stairs. Decorated with green and off-white decor, this room also has ten foot high ceilings, wainscoting and beautifully preserved hardwood floors. It has a queen size, four-poster bed, two armchairs, gas fireplace, a flat screen TV, and full tiled bathroom with tub/shower combination. Connecticut is a cozy and traditional style room located on the second floor of the main house. The Connecticut room has a four-poster bed, hard pine wood floors, red and white toile wallpaper,a lovely sitting area with a gas fireplace, and a flat screen TV. The private bath has a corner shower. Camden is a delightful, sunny room on the second floor with a queen four-poster pineapple bed, antique armoire, gas fireplace and a flat screen TV. The bathroom features a tub/shower combination. Wyeth is an elegant corner room located on the second floor of the main house. Ten foot ceilings, three large windows with original wooden shutters, a maple king size bed, gas fireplace, two armchairs, and a flat screen TV. The private bath features a new tile shower with multiple body jets. Montpelier is a large corner room on the second floor of the main house. It is traditionally decorated in colonial blue and white and has a king four-poster bed, gas fireplace, two armchairs, a flat screen TV, and tiled bathroom with shower. Monhegan is located on the third floor and is uniquely furnished with an enormous king size sleigh bed, a two-sided gas fireplace, and a flat screen TV. The bath is Italian tiled and features a glass block shower with dual shower heads, pedestal sink and a claw foot soaking tub raised on a platform with a view of the gas fireplace. Wiscasset is a beautiful, large room on the third floor of the main house, with a king size Verdigris iron bed, lovely sitting area in front of a gas fireplace, a private garden, and a flat screen TV. The large bathroom has a pedestal sink and features a walk in Italian tiled shower with dual shower heads. Arundel is one of the larger rooms on the property located on the second floor at the end of a private hall. This room is decorated in a neutral pallet with chocolate accents. There is a large two person whirlpool spa, three-sided gas fireplace and Italian tiled bath. This room also has a comfortable sitting area with a flat screen TV and refrigerator. Terrace is located on the first floor with French doors that lead directly to the brick terrace. It is reminiscent of a seaside cottage in Maine. This room has a queen bed, flat screen TV, refrigerator, charming sitting area, and a bathroom that features a skylight and a tub/shower combination. New Hampshire this large two room suite is located on the second floor of the carriage house with an outside entrance through a screened porch shared with the Vermont Room. Decorated in earth tones, reflecting New Hampshire's New England heritage, this king size bedded room has a stall shower and a sitting room with a twin size day bed,flat screen TV, and refrigerator. Hideaway is a small, cozy, second floor room with private, outside access. The room features a plush queen size bed under a skylight, and a small private bath, making this room the perfect little hideaway. 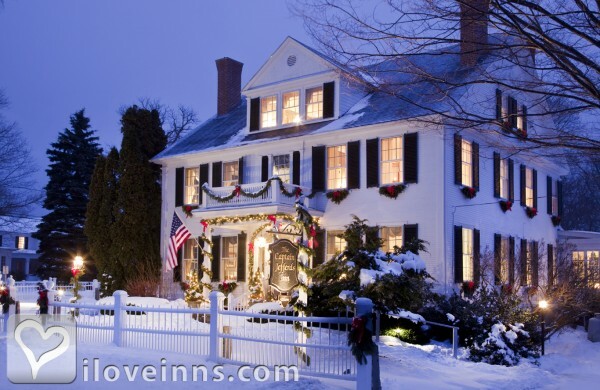 It has all the amenities and benefits of the inn, and can be used in conjunction with the New Hampshire suite through an adjoining doorway. Baxter is a luxury room. Inspired by the old Maine camps, this room has a unique king size wooden bed, gas fireplace, terra-cotta tiled bath with shower, a large two-person whirlpool tub, a flat screen TV, and a refrigerator. This is a very romantic room with its own entrance and private screened porch. The Garden Room is so named as it is located on the first floor of the carriage house, and accessed by the kitchen garden path. Recently renovated, this room has the original hand hewed beams, two twin beds, two plush arm chairs, flat screen TV, desk and a tiled shower. The Garden Room can be enjoyed with either a king or twin beds. Please note during the reservation process which bed configuration you would like for your stay. Payment types accepted include Discover, American Express, Master Card, Visa, Travelers Checks and Personal Checks. Rooms: This property has 16 total guest accommodations with private bath, 9 with fireplaces, 2 with whirlpools, 2 two-bedroom suites. Minimum Stay Requirements: Two days weekends June-October. Three-night minimum stay required for holidays and special events. Cancellation: Your deposit is refunded minus a $50 processing fee with 1 week prior notice, if less than 1 weeks' notice is given you will be responsible for the total amount of your stay, unless we are able to rebook your room. We require 30 days prior notice for Christmas Prelude reservations. Pets: Pets Allowed and 5 pet-friendly rooms available; with prior approval dogs are $35 per day per dog. Meals Included in Rates: Breakfast, Afternoon Tea and Snacks/Refreshments. 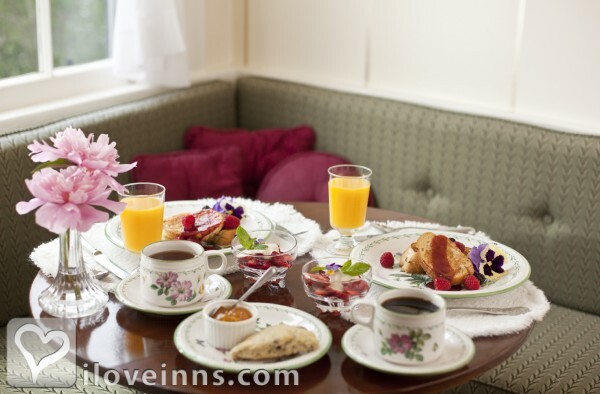 Types of meals: Hors d'oeuvres, Afternoon Tea, Vegetarian Breakfast, Wine, Full Gourmet Breakfast and Early Coffee/Tea. Amenities In Room: Turn-Down Service, Wireless Internet Access, Refrigerator, Hair Dryer, Fireplace, Iron/Ironing Board, Bathrobes, Bath Amenities, Air Conditioning, Telephone, Cable TV, DVD, Television, Two-person whirlpool spa, Double-headed showers, Down comforters, Feather beds and Luxury linens. Amenities On Site: Tesla charging station, Free parking on premise, Gift Shop, Computers, Universal charging station for electronic vehicles and Fax. Business Traveler Amenities: Television, Off-site Dry Cleaning Services, Iron/Ironing Board, Internet Access, Hair Dryer, Flexible Check in/out Times, FAX On-site, Desk, Daily Newspapers and Wireless Internet Access. Events Hosted: Honeymoons, Romantic Getaways, Seminars, Meetings, Family Reunions and Weddings. Other Activities: Art Galleries, Beaches, Bicycling, Canoeing/Kayaking, Fishing, Golf, Hiking, Live Theater, Museums, Parks, Shopping (Local Crafts), Skiing Cross Country, Skiing Downhill, Water Sports, Antiquing, whale watching and sailboat cruises. On The Marsh, Old Vines, Hurricane, Pier 77, Bandaloop, David's KPT, 50 Local, Ocean. Constructed in 1804 by Mr. Daniel Walker and family. Mr. Walker gifted this estate to his daughter upon her marriage to the seafaring Captain William Jefferds in 1805. Historic Awards: National Register (Granted), State Register (Granted) and Local Register (Granted).